The sun provides a clean and infinite source of energy and has the potential to meet the sustainable demands of all future energy requirements. However, one major problem remains: the sun doesn't shine all the time and it is very difficult store its energy. For the first time, scientists from the ETH Zurich and the Paul Scherrer Institute (PSI) have revealed a new chemical procedure that utilizes thermal energy from the sun to directly turn carbon dioxide and water into high-energy fuels. The new process was developed based on a new material combination of rhodium and cerium oxide. This research breakthrough could significantly lead to the chemical storage of solar energy. The study findings are published in the research journal Energy and Environmental Science. Energy from the sun is already being used in different ways. While photovoltaic cells turn sun light into electricity, solar thermal systems harness the sun’s thermal energy for heating water or other fluids at a high temperature. The second method is largely used in solar thermal power plants where thousands of mirrors are used to direct the sun light on a boiler wherein steam is produced either directly or through a heat exchanger at temperatures more than 500°C. After that, turbines turn the thermal energy into electricity. The PSI and ETH Zurich scientists worked together to develop an innovative alternative to this method. The newly developed process utilizes the thermal energy from the sun to directly turn carbon dioxide and water into synthetic fuel. This allows solar energy to be stored in the form of chemical bond. It's easier than storing electricity. The new approach is based on a similar principle to that used by solar power plants. Alxneit and his collaborators harness heat to produce specific chemical processes that occur only at very extreme temperatures, higher than 1000°C. Developments in solar technology will soon help to achieve such temperatures utilizing the sun light. Alxneit's research is based on the theory of the thermo-chemical cycle process, which comprises of the cyclic method of chemical conversion and the required heat energy, referred to as thermal energy. A decade ago, the potential of turning low-energy substances such as the carbon dioxide and water into energy-rich materials such as carbon monoxide and hydrogen had already been revealed by researchers. This can work well using specific materials such as cerium oxide, which combines the metal cerium with oxygen. Cerium oxide frees some oxygen atoms during temperatures of more than 1500°C and tries to reacquire oxygen atoms at very low temperatures. When carbon dioxide and water molecules are directed toward an activated surface, they discharge oxygen atoms (chemical symbol: O). During the process, carbon dioxide (CO2) is converted into carbon monoxide (CO), and water (H2O) turns into hydrogen (H2) at the same time as the cerium re-oxidizes itself, creating the preconditions to begin the cerium oxide cycle again. The carbon monoxide and hydrogen produced during this process can be utilized to generate fuel, particularly, fluid hydrocarbons or gaseous such as methane, diesel and petrol. These fuels can be utilized directly, however, they can also be stored up in tanks or supplied into the natural gas grid. So far, Fischer-Tropsch Synthesis, a process developed in 1925, was required for this kind of fuel production. Recently, the European research consortium SOLARJET suggested a new way to combine the Fischer-Tropsch and a thermo-chemical cycle procedure. Although this basically solves the storage problem, considerable technical effort is necessary to carry out a Fischer-Tropsch Synthesis. A second industrial-scale technical plant is needed in addition to solar installation. 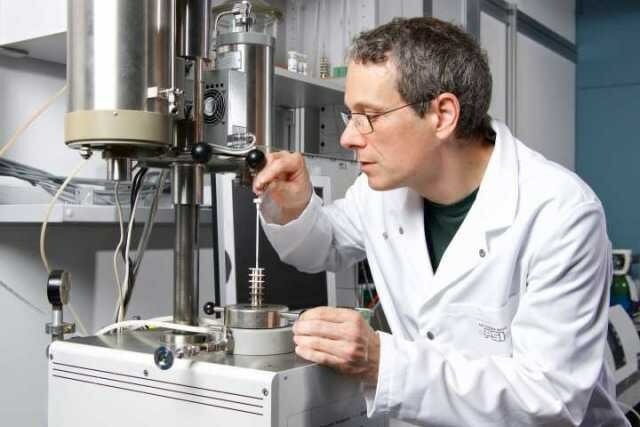 Through the creation of a material that enables the direct production of fuel with a single procedure, the new method created by Ivo Alxneit and his collaborates distributes with the Fischer-Tropsch procedure as well with the second step. This process was achieved with the addition of a small amount of rhodium to the cerium oxide. Rhodium is a catalyst that allows specific chemical reactions, and it has been accepted that rhodium allows reactions with carbon monoxide, carbon dioxide hydrogen. The catalyst is a pivotal research topic for the production of these solar fuels. At the time of the cooling procedure, the very small rhodium islands present on the material surface should not be allowed to vanish or grow in size as they are necessary for the projected catalytic process. The fuels, produced as a result of this process, are either utilized or stored in tanks and the when the cerium oxide is re-activated, the cyclical process starts all over again. Scientists working at the PSI and the ETH in Zurich laboratories investigated the cerium-rhodium compound by utilizing different standard processes of structure and gas analysis and examined how the cerium oxide works well when reduced and how the methane production becomes successful. So far, our combinatory process only delivers small amounts of directly usable fuel, but we have shown that our idea works and it's taken us from the realms of science fiction to reality. Throughout their work, the scientists used a high-performance oven at the ETH instead of solar energy. “In the test phase, the actual source of thermal energy is immaterial,” explains Matthäus Rothensteiner, PhD-candidate at the PSI and the ETH Zurich whose area of responsibility included these tests. Jeroen van Bokhoven, head of the PSI's Laboratory for Catalysis and Sustainable Chemistry and Professor for Heterogeneous Catalysis at the ETH Zurich adds: “These tests enabled us to gain valuable insights into the catalyst's long-term stability. Our high performance oven allowed us to carry out 59 cycles in quick succession. Our material has comfortably survived its first endurance test.” Researchers, who have shown the feasibility of the procedure, can now work on to optimize the method.